We live in a rather amazing age, where there are tools to measure just about anything you’d like to measure in your life. Calorie counters, heart rate monitors, and more line the shelves of sporting goods and health stores, and there are probably a million ways to use each of those. 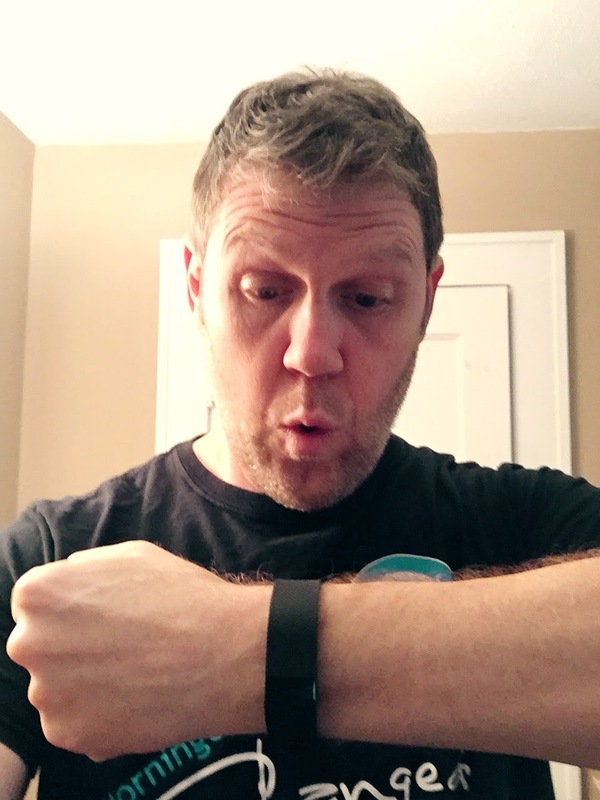 Whoa… geeked out by the new Fitbit Charge HR! I joined the ranks of these owners yesterday when I was given a Fitbit Charge HR . This little dude, if you haven’t seen one, is a wrist-worn monitor that keeps track of your heart rate (hence the HR – other Fitbit models apparently do not do this), steps taken, floors climbed, calories burned, and more. If you pair it with a smart phone via Bluetooth, you can use it to monitor things like your sleep (time and quality of sleep), etc., calorie intake, water drunk, and more. There’s a pretty slick app and web-based desktop to help you monitor all this. Up till now, I have shied away from a lot of the “quantified self” mentality for a long time, because I like to travel a more natural road in my quest for health. But I also recognize that this model can only go so far, and that in our modern society (with so many outside stimuli and stressors) we’re not always totally in touch with what our bodies are trying to tell us. Food quality and ingredients, external electronics, light, sounds, and more can really play havoc with our lives and the signals that our bodies are sending us. The readout from last night’s first run of sleep monitoring. And so I’m pleased to be able to start this journey with tools like my new Fitbit. Different ways that tools can help you! 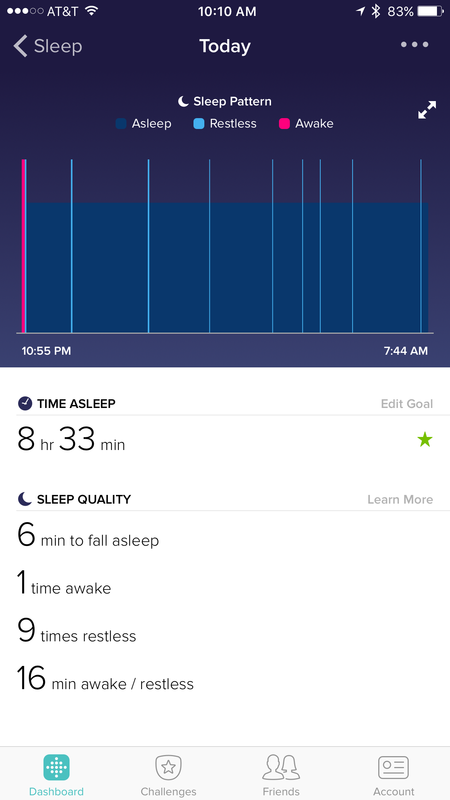 Saturday night, I used it to monitor my sleep, for example. And it gave me a really neat breakdown of my sleep quality. You’ll see how long it took me to fall asleep, how many times I woke up, how many restless periods I had, and how many minutes I was asleep or restless. There’s an advanced option on the sleep monitor, and I turned that on because I’m curious to see whether there’s a specific time that I’m restless during the night. 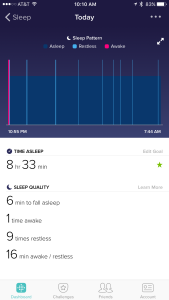 This should give me information that I can use to see when I might be best served to try to sleep – maybe I should be a polyphasic sleeper or something? Another thing I’m interested to try is monitoring my heart rate variability (HRV). A lot of health experts have been reporting on this recently, including some of my favorites such as Mark Sisson, Ben Greenfield, and more. Basically, HRV is a measurement of the interval between heart beats and a higher rating is considered more healthy than a low rating. The idea here is that a high rating shows that your heart is capable of changing to the rate that is most efficient and optimal for you quickly with a higher rate, but a low rate shows that you have trouble adapting to the new situations your body is in and thus changes rate more slowly. I’ve read that this may be the most accurate assessment of physical capability and health around, and with a full-time monitor it should be very easy to track. The Fitbit software for the iPhone (like I have) doesn’t include an HRV monitor (yet?) but there are apps that can do this and connect to your Fitbit or other heart monitor (Polar, Garmin, etc.). I’m anxious to try this out. Some of the apps I’ve seen and have been reported by other sources like Sisson and Greenfield are the Sweetbeat app from SweetWater Health, Greenfield’s own NatureBeat app, IThlete, and BioForce. The steps tracker should also be useful – trying to stay over 10,000 steps a day is just a good idea, and a very easy to to keep the body moving throughout the day. This has been more than adequately covered, I think, in all the literature, but it is available on the Fitbit, as is a monitor of floors climbed. I like that one, too… especially with all of the hills that a good obstacle course race has in it. Good stuff to know and to try to improve upon. I’m less concerned with the number of calories I burn and take in, as those numbers haven’t been proven to show much in an active person, plus there are tons of factors that can affect those numbers and make simple monitors of activity be less than accurate and useful, but it can be interesting. We shall see how that works. Other thing is tracks are distance traveled, minutes that we’re active throughout the day, and things like that. All in all, it should be interesting to match how I’m feeling to the data. Perhaps I’m wandering away from my more natural outlook on this stuff, but combining the natural methodology with modern tools should make for an interesting experiment going forward! Do you use any tools like a Fitbit or otherwise in your health and vitality journey? Do you use them in ways that I haven’t mentioned? Let us know in the comments, and please share this article with your friends and loved ones on social media!